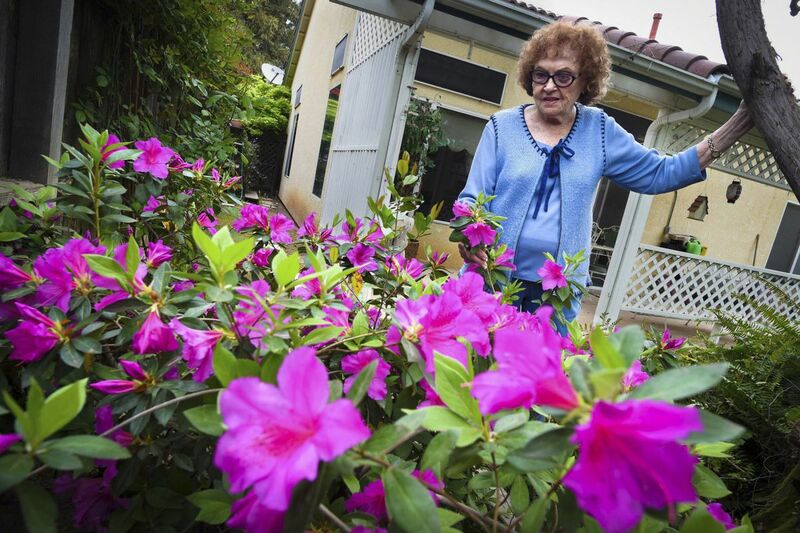 Ninety-three-year-old Pat Brooks admires her bounty of azalea blooms. Pay attention to your azaleas. The one in our community garden seems to be totally covered in soot. Closer examination shows the soot is moving, and is actually made of little tiny bugs with exquisitely lacy wings. (Isn't it a great idea to have a magnification app on your phone?) In any case, I can treat the symptoms — spray the leaves top and bottom with an insecticidal soap OR cover it with fine netting and release some voracious lady bugs to do the dirty work — or, I could get to the bottom of why the plant is so overwhelmed. Such drastic infestations are usually the result of a stressed-out plant. This particular azalea, traditionally a shade-loving plant, is stuck in the middle of a full-sun garden. We can keep treating it for the bugs, or we can move it to a shadier location where it can recover, grow stronger, and be better able to resist the invaders. Plant some more tomatoes. Lie the gangly ones down horizontally and cover the stems with soil. Take off all the flowers and fruit to make them concentrate first on making roots. Turn your houseplants into a hedge or ground cover. Well, maybe an aspiring hedge. I recently moved my coleus outside to "plant camp," and managed to break off lots of pieces in the process. These stems (6 inches is a good size) will root happily in garden soil, and, given the right conditions, will grow into some sizeable outdoor ornamentals. Wandering Jew, Swedish ivy, and angelwing begonias will make perfectly acceptable ground covers when you stick all those 4- to 6-inch pieces into the soil of a flower bed. That way, it looks like you intended to roll it down the steps when you brought it out. Sally McCabe is associate director of community education at the Pennsylvania Horticultural Society (phsonline.org) and a co-owner of Cobblestone Krautery (www.cobblestonekrautery.com).